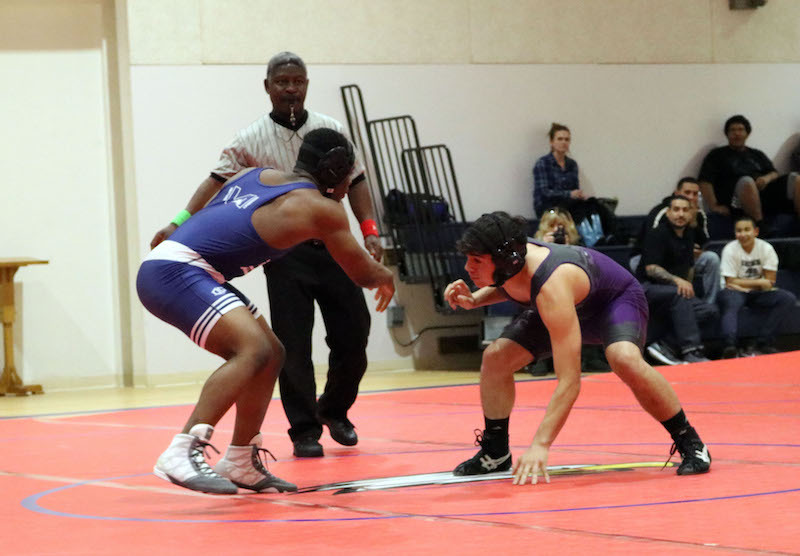 The Two Denair High wrestlers gained valuable experience, their coach believes, before they were eliminated at last weekend’s Sac-Joaquin Division V meet in Delhi. Cody Martinez (126 pounds) and Quentin Parker (160) both were first-time qualifiers for the Division V meet. Martinez, a freshman, was pinned by Hughson’s Trace Huber in his first match. Huber went on to qualify for this week’s Masters meet in Stockton. Martinez bounced back to pin Michael Alcoriza of Argonaut in the second round, but then got pinned himself by Josh Stubbert of Big Valley Christian in his third match. Parker, a junior, was pinned by Bryan McCoard of Golden Sierra in the first round. He got a bye in the second round, but lost by technical fall (trailing by 15 points) to Jacob Giles of Bradshaw Christian in his third match. 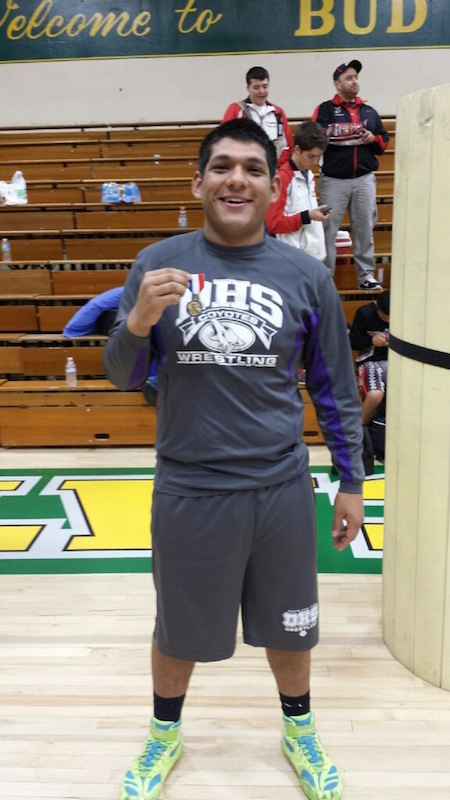 Two Denair High wrestlers qualified for this week’s Sac-Joaquin Division V meet. Cody Martinez (126 pounds) and Quentin Parker (160) both finished third last Saturday at the Southern League Championships at Orestimba High in Newman. Martinez, a freshman, was 4-3 during SL dual meets before finding his rhythm last weekend. Parker, a junior, also is a first-time qualifier for the Division V meet. He was just 2-5 during the dual meet season, but also displayed some of his best wrestling at the league meet. The Division V tournament will be contested Friday and Saturday at Delhi High. The top four in each weight class advance for the Masters meet Feb. 23-24 in Stockton. Don Helnore was encouraged by the success of last year’s Denair High wrestling team, which finished third in the rugged Southern League. And though the Coyotes lost five seniors, the veteran coach is optimistic that his 16-man group can live up to similar expectations this time around. Three wrestlers who qualified for the Division V Tournament return – senior Jordan Cervantes (132 pounds), junior Kyle Prock (138) and senior Kyle Perkins (220). “We have a basic plan for all our guys. As you see them wrestle and move, you find out what they’re good at and build on that,” he said. “But like in any sport, you have a basic foundation that you teach. Flashing what his coach described as a “brute strength kind of move,” Luis Mendoza got the ultimate payback against a tough wrestling opponent – a pin. The result was a third-place finish Saturday for the Denair High School senior at the Sac-Joaquin Section Division V Championships and a trip to this week’s Masters Meet. It also touched off an enthusiastic celebration by his Coyotes teammates at the Sonora High gym. Mendoza, competing at 197 pounds, was the only Denair wrestler to survive the rugged two-day tournament. The top four in each weight class advanced to the Masters. The next closest Coyote was Richard Richards, who finished sixth at 140 pounds. Mendoza put himself in a difficult spot Friday when he was pinned by Anthony Howard of Bret Harte in his first match. He rallied to win two consolation bracket matches Friday to stay alive, then pinned his first opponent Saturday. That set up a rematch with Howard, with the winner guaranteed a spot in the top four and a berth in the Masters Meet. “It was back and forth, like the first match,” said Denair Coach Don Helnore. “This time, Luis caught the kid and pinned him. … Luis escaped a bear hug move and got his arms around him and just put him down on the mat. With that, the Coyotes celebrated and Mendoza moved to the third-place match, where he used a pair of two-point reversals in the second and third periods to defeat Riverbank’s Jose Ariza. The gym is a busy place these days at Denair High School. The boys and girls basketball teams plus the wrestling team all have begun their winter schedules with an eye toward preparing themselves to compete for Southern League titles in January and February. Despite a 10-player roster, third-year coach R.J. Henderson is confident the Coyotes have improved enough to contend for one of the league’s three spots in the Sac-Joaquin Section playoffs. “I’d like to think the last week or two of the season we’ll be playing for something,” said Henderson, whose young team won just seven games a year ago. This season, the Coyotes will benefit from a sizeable presence in the middle in the form of 6-foot-3, 280-pound senior center Ryan Galhano, who didn’t play last year. Henderson expects Galhano will be one of the most physical players in the Southern League. Three other seniors – forwards Dominyc Silva and Chase Vann and guard Vince Fuentes – were named tri-captains. Junior guard Isaac Starks, who played on the varsity as a sophomore, rounds out the starting five. Henderson said he’s the team’s best option to create a shot off his dribble.